The Billionty-Oneth Geek: "If You Fall, Fall On Me"
"If You Fall, Fall On Me"
Last summer, during my trip to Costa Rica, me and a few tour-mates went on a canyoneering/rappelling adventure tour. It was a beautiful experience; traversing along a stream in a mountain and rappelling down when the cliffs were too high. It was the first time I’ve ever done rappelling and it was a thrilling experience. 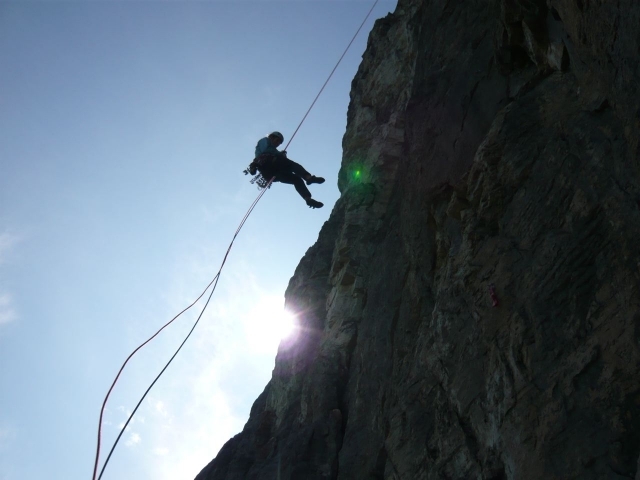 In very non-technical terms, in rappelling, you descend cliffs with a rope attached to your harness, gripping and releasing the rope with your hands as you lower yourself down. But you’re not alone. At the bottom of the cliff is your spotter, who holds the end of the rope, and who controls your speed. So at the highest cliff of this tour, I was 60 meters above the ground below and had to leap, relying on the spotter below to keep me from pancaking at the bottom. My life depended on the spotter. The other night, I was sharing prayer requests with a friend. His request was for wisdom on how to rely on God more and to understand that He has a plan for him. As he was sharing this, inside I was like, “Yes! Yes!”, because this too was on my mind and I knew I needed it as well. I think I’ve depended on myself too much when going through tough times, trying times or when facing hard decisions. We try to carry the burden on our own. I talked about it with my roommate Zoro before. I feel like there’s this void in me. And instead of talking about it or handling it in a more appropriate way, I try and fill that void with stuff. Like literally, stuff. I’m always hunting for new games, movies, books or comics (BUT always on sale at least :), stock-piling all this media in hopes of filling in this void. It hasn't been healthy. The realization of this void has been very recent. It helped to realize and understand this and tell someone. Related note, the other day I almost ordered Battlefield 3, as it was 50% off. Just before I completed the order, I said, “No! I don’t need this!”, and hit cancel. It was close! Phew! I think that’s a common danger for the young Christian person – to believe that they can handle stress and burdens by themselves all the time. But we can’t forget that as much as we think we can accomplish it all on our own, we’re never really doing it alone. God IS working with us in tandem. He is your spotter. He catches you when you fall. And I know it’s hard, especially for a young person. You have your life ahead of you and you’re blessed with so much. Opportunities are presented to you left and right, and to that extent, it can be overwhelming. You’re a kid in a candy store, where do you start? What reason do you have to turn to God at all? It’s been told to me a number of times in this past year. The moment when things start to click into place is also the moment when you’ve learned to give it up to God. There is no burden too heavy. I know that several friends and myself are in the same boats – burdening ourselves with worry in regards to career direction, relationships, church-life, etc. In Matthew 28, He tells us: “Come to me, all you who are weary and burdened, and I will give you rest. Take my yoke upon you and learn from me, for I am gentle and humble in heart, and you will find rest for your souls. For my yoke is easy and my burden is light”. We say that we’ve accepted Him and that we love Him, but how often do we honestly go to Him? Do we pick and choose those moments or have we surrendered all? My fault is that I do, honestly, pick and choose moments. I ask Him for ways that he can satisfy my plans instead of asking how I could satisfy His. There’s a marked difference between dependence and utilization. So I've been trying to retrain my mind. I’ve asked those close to me for prayers in regards to discipline. Since Lent, I’ve been making sure that I’m taking time each night to dig into the Word. To start understanding, I need to starting listening, and to start listening, I need to start reading. The Scripture has been helping. I don’t know if this is the only solution, but I know it’s a start. I don’t think any of this is easy stuff, but at the same time, I know it’s not impossible.